"Perfect way to warm a cold winter day!" 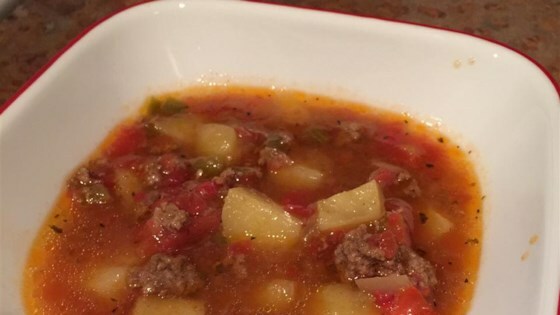 In a large saucepan, combine hamburger mixture, tomatoes (in juice), potatoes, and tomato sauce. Mix well. Stir in water, salt, pepper, and hot pepper sauce, and bring to a boil. Reduce heat, cover and simmer for 45 minutes or until potatoes are fork tender. Okay soup. Could use more hot sauce. Also, I could add more potatoes. This was a great dairy-free potato soup for us!